Webb Brothers was an early furniture and department store located in downtown Bismarck for over sixty years. The Webb brothers, William and Philip, came to Bismarck in 1884 from New Jersey and opened a furniture store. Webb Brothers later expanded their merchandise to include dry goods and carpet. For five years, Webb Brothers was the only dry goods store in Bismarck; and was also the only furniture store between Jamestown, North Dakota and Glendive, Montana for twelve years. The famous August 1898 Fire destroyed the Webb Brothers store, forcing them to construct a brand new building to house their business at the intersection of Third Street & Main Avenue, where it remained until ultimately closing in December 1945. When competitor A.W. Lucas and Company opened in 1899, Webb Brothers welcomed the competition, so much so that they provided financial assistance to their competitor. Webb Brother’s move paid off as their business actually increased after the opening of A.W. Lucas. Philip retired in 1921, but William continued to operate the business. In 1928, Webb Brothers opened Bismarck’s first funeral home. It was at this time that the store exited the dry goods business, and instead expanded their furniture selection. 1928 also saw a change in ownership to the sons of William Webb, Philip and Robert. The Webb Brothers often had annual sales nearing half a million dollars (not adjusted for inflation). 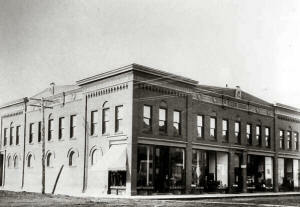 In addition to their retail store, the Webb Brothers were also active in real estate, developing and purchasing several buildings in Bismarck. In addition to running his store, William Webb served one term as Bismarck mayor. He also served on the city council, and as chairman and president of several organizations, including the board of county commissioners. Webb Brothers was first located at 514 Main Avenue, then relocated to 223 Main Avenue. The Webb Brothers Block was completed in 1900, housing the retailer until its closure. The second floor of the Webb Brothers Building housed the Federal District Courtrooms until the completion of the first Federal Building in 1913, and also housed state government offices for a short time following the Capitol’s destruction in 1930. Immediately following Webb Brother’s closure, the building underwent major renovation, initiated by national retailer Sears, who then occupied the building until it relocated to Gateway Mall in 1979. Conlin’s Furniture then occupied the building, until it too relocated to Gateway Mall in 2004. Today it is home to Zimmerman’s Furniture. This article is part of an exclusive series on BismarckPride.com, click here to read them all.